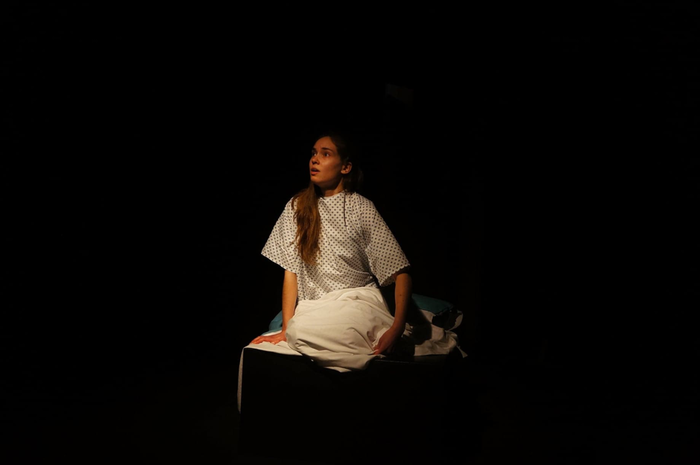 BirthdA is a one-woman show written by Alannah Lewis, directed by Zoe Black and performed by Teuta Day. It explores the birthdays of Day’s character, a girl with Asperger’s, throughout her teenage years. Perhaps this tale of growing up sounds like one you will have heard before. Think. Again. Lewis brings a fresh perspective, dizzyingly mesmerising in its ability to flit from one relatable, entertaining anecdote to the next, while somehow effortlessly incorporating the darker moments that gradually weave together to form a nuanced and intricate story. Lewis’ writing covers problems from what to do when you don’t like your birthday presents to how to handle the death of a relative and everything in between. There are many frankly hilarious sections, their humour striking in its relatability; I specifically enjoyed the description of a particularly beige jumper, as well as a segment on writing your name on an exam paper – surprisingly easy to get wrong, I agree. So many boxes! However, more impressive, even, was the fact that these moments often occurred almost parallel to moments of stillness and honesty, heart-breaking in their quiet contrast to BirthdA Girl’s otherwise bright and cheery personality. Throughout, you felt like you were torn between the need to laugh and the need to cry. The framework, in general, had a powerful progression and a wonderfully teasing lilt to its gradual release of information about the wider world beyond BirthdA Girl’s bedroom. Despite the fact it was down to one character to tell us all about her life, you never actually felt like you were being told a story, more just listening to the inner workings and humorous ramblings of BirthdA Girl’s mind. And Day absolutely drives this story to its fullest capacity. Directed exquisitely by Black, she has an intense energy that allows her to convey every word, every second, to the extreme. She perfectly captures BirthdA Girl’s quirks and characteristics, creating a beautifully detailed, flawed, bright, hopeful individual, toying perfectly with Lewis’ darting, dancing script. But not only was she exquisite at perfecting one infinitely nuanced character, she was also able to multirole into other characters right before our eyes with a directness that was so quick it was hypnotising. She was able to switch between the two characters while never missing a beat and never losing the emotion from either side of the conversation. There was one scene in particular – an argument with her best friend Jade – where I could’ve sworn there were two people on the stage. Perhaps the only thing I felt slightly lacking was moments of utter stunning still and quiet. Don’t get me wrong, Day’s projections of stillness were incredibly touching, but I felt they could have been pushed to a higher level of intensity. This could have been a conscious decision, a feature of Day’s full-on, slightly manic characterisation, but I felt that there were beats that perhaps could have been prolonged to really draw the audience into the darker moments. That being said, there was a stunning lighting transition, timed to perfection, that created one particular gut-wrenching turn in BirthdA Girl’s thoughts which worked incredibly effectively. "An utterly captivating rollercoaster ride of ageing and every anxiety that comes with it." An interesting addition to the play were the video clips, filmed by Olivia Railton, used to transition from year to year. These were, generally, beautiful exhibitions of interesting videography taking everyday objects and experiences, like walking along a woodland path in winter and combining them into a sort of moving mood board of serenity. On the whole, I enjoyed them and thought they worked very well to show the passing of time, but I would have perhaps liked a little more normality to them to fit better with Lewis’ very relatable writing and Day’s very relatable portrayal. They were perhaps a little too edgy and symbolic for my liking with a leaf in the frost or half of a “best friends” heart necklace. They were, however, accompanied by some thought-provoking music by Finlay Stafford which really drove the videos along and created an eerie feeling to the passing of time that fitted very well into the slight fear of growing up created by the play itself. Overall, BirthdA is simple but effective. It makes you laugh while simultaneously wrenching your gut out. Lewis’ writing, Day’s performance and Black’s direction make for an utterly captivating rollercoaster ride of ageing and every anxiety that comes with it. The gradual, tantalising release of information grips you throughout, hurtling you towards a haunting ending that makes you wish you didn’t have to grow up at all.